Parking at the Town Center garages, normally charged, will be free. There is a changing room that we can use. That said, we will not be the only ones in there. Personally, I find it easier to change at the vehicle, but in the past we have used the parade’s changing room, so that’s still an option. Lori has also graciously helped us find changing space in the past as well, so as we get closer to the event the options usually start to crystallize. My truck will be be there as a prop for us to use. In the past, we’ve dressed it up with banners, lights, and even Christmas trees, and various characters, like Jawas opening presents and our acclaimed “Santa-Vader” have ridden in the bed. If you have any suggestions on how to meet the theme or can help with preparation, please get in touch with me ASAP. We encourage troopers to celebrate the season by adding festive touches to their costumes. People have used Santa hats, holly sprigs, and even carried the oversized candy canes in the past, and the crowd loves it. We will probably try to gather somewhere after the parade to let people take pictures with us. More information coming on that one as we get closer to the event. We will meet for a post-troop late lunch at the NorthPoint Shopping Center Glory Days restaurant. I will have further information as the date gets closer, with which I will update this post. Please post if you are planning to attend and your costume type. 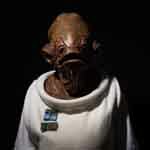 I am in as Admiral Ackbar if weather allows. I can be a handler if it rains or snows. Weather permitting I'll go as Chewie, if not I will go 501st TK. I'm on travel all week, have fun! Please let me know if you would like to change at my office before the parade. It is at 12100 Sunset Hills Rd, Ste. 300 in Reston. The building doors are usually locked on the weekend, so you will probably need me to get you in the door. It is a secure space to store your things and there is a lot of room and there is restroom access, but it is about 15-20 mins walk from the parade start. If you don't want to do the extra 15 minute walk to the Reston Town Center by changing at my office, you can either change at the parking garage or at the changing area shared by all the parade participants. Parking at the Town Center: I suggest the Fountain Parking Garage located at the corner of Fountain Drive and Freedom Drive - the parade muster is happening right in front of the garages. But, be sure to get there early because they will no doubt be blocking off some of the entrances to allow for parade preparation- I don't know what time. Line-up time is 10 AM, so please plan to be suited up and at the muster site by 10 AM whichever place you want to change. Changing area: Fountain Parking Garage is still pretty convenient if you want to use the parade changing area, which is in the old Charles Schwab office located by Talbots on Market Street. From the Fountain Parking Garage, cross Freedom Drive and turn left to go towards the Potbelly restaurant. Turn right by the Potbelly and walk towards the Fountain in the Square. Turn left at the corner - the old Charles Schwab office is just past Talbots on Market Street. If you do want to change at my office and walk to Reston Town Center with Chewie and Ackbar, then please let me know - you will need me to get access to the office. We will be meeting at 8:45 AM, and starting the walk to the Town Center at 9:30 AM.